On September 9th The Queen opened the longest new domestic railway to be built in the UK in over 100 years. Borders Railway runs from Edinburgh to Tweedbank along 30 miles of new track, 21.5 of which is single track. 7 new stations have been built, and while I was up in Scotland I decided a trip on the new line was essential. First of all the cost. The distance from Edinburgh to Tweedbank is roughly the same as Ipswich to Witham. An off peak day return from Ipswich to Witham is £16.10. A return from Edinburgh to Tweedbank is £11.20. I know public transport in Scotland is cheaper than England but for a 55 min journey this is good value and judging by how busy both journeys were is paying dividends. Journeys are operated by either Class 158 or 170 Dmu's. My vessel for the return trip was 158702, and very nice it was too. Here it is at one of Edinburgh Waverley's hidden platforms - quite possible the Northern Hogwarts Express leaves from Platform 9E! The route out of Edinburgh starts slowly, but does give some good views of carriage sidings. Unfortunately I was the wrong side of the train going out and we were going too fast coming back to get any decent pictures, which was ac shame as one of the last Network Rail liveried class 31 locos was there, as was a lone Cross County HST loco attached to an increasingly rare Class 08 shunter. However we were soon on the new line and to be honest the first half hour is fairly sedate with regular stops. It is only after leaving Gorebridge that the line opens up, the scenery becomes spectacular and the train gets a move on. Scenes such as this are regular. Excuse the quality of those pics - we were doing about 80mph at the time! All to soon we had passed through the picturesque town of Galashiels and were at the terminus of Tweedbank, where there was a 10 min layover to strech legs and get souvenir picture! Now there is one feature of the railway that caught my eye, and that is the novel way the line is protected from landslips. There are miles of dry stone walls constructed from ballast held in chicken wire cages. I have no idea how long thess took to construct but I think they add character to the line and show the amount of thought that went into it. The railway was constructed in just 5 years and on time. My only quibble is that it doesn't connect with anything at the Tweedbank end. Surely these days no more dead end lines should be built. I just wonder if there was a case for extending the line to Berwick via Kelso maybe, to provide an alternative to the ECML during engineering works, for example, which would also attract people to the line from the likes of Newcastle too. Just a thought. Anyhow I liked the line, and hopefully will spend a day next Summer exploring it, and the places it stops at more. Of course Edinburgh Waverley station normally throws up a few good photo opportunities and the Saturday morning I was there proved no exception. We begin with an icon still possessing great presence, even if the soundtrack doesn't sound quite right these days. There are quite a few Emu's in Scotland I have yet to sample. One of these was parked up just waiting to be photographed. There were two locos in situ that I assume had been used as part of the Caledonian Sleeper the previous night. 67030 and 90044 were rather conveniently sitting on adjacent platforms. And finally my favourite pic of the day - two old relics in the same picture. I thought originally I had got part of Edinburgh Castle in shot but it turns out it's another rather old building close to the castle. Still like the pic though. When is a Streetdeck not a Streetdeck? Here is a little pictorial test for you all. Which of the following are Streetdecks and which are not. Congratulations to anyone who spotted that pictures 1 and 3 are Streetdecks. Pictures 2 and 4 are Volvo B5LH's apparently. Nope I can't see any difference whatsoever either. I'm grateful to Peter Abbey for pointing out that the Lothian Streetdecks I had been so scathing about were not actually Streetdecks. That was embarrassng but I think forgivable. So here is another question for you. Which of these is a Gemini 3 body? If you haven't yet read Parts One, Two, and Three yet you really need to or this will all seem rather confusing. On Sunday afternoon after lunch in Edinburgh City Centre the rain closed in so my friend and I decided to go to the cinema to see the new Bond film. I'm not here to review the film but can someone give the director a slap and tell him the 15 does NOT go over Westminster Bridge, or indeed any bridge over the Thames! However to get to the cinema meant a ride on one of Lothian's Volvo 7900 Hybrids. I wasn't expecting one of these to be part of the comparison but I'm glad it was. I went on one of Lothian's older models last year, as well as the ones First Essex have on the 100 Chelmsford - Lakeside service and hated them so much I even tweeted Volvo to say so. But I had a pleasant surprise - the newer ones are a vast improvement. The gap between electric motor cutting out and diesel engine cutting in is much shorter, the horrible vibrations have gone - it's feels far less than a B6 now, and it was a good comfortable ride. My only concern, which my friend who travels regularly on them brought up, is that they are stuffy with no opening windows. I'm not sure in a capital city that is a good move as the climate never has a chance to settle. I would think in Summer they can get extremely hot, but still a massive improvement on the original 7900's. I had saved what I hoped would be the best till last. On Monday I caught a Scotrail Class 170 up the east coast in glorious sunshine to Aberdeen. Ever since I read about a joint venture between First and Stagecoach in Aberdeen involving some Van Hool tri-axle A330 hydrogen buses I had wanted to ride one. First of all they are very big, however are still only 42 seaters which is surprising as it looked more. Anyhow I quickly located the bus station, and boarded one of the Stagecoach versions to Westhill, a suburb of Aberdeen about a 30 min journey away. I must say they look rather impressive. As you would expect from a gas bus they are quiet. What I didn't expect, though, was that they only appear to have one gear, so sound more like a tram than a bus, and top speed seems very low, 40 - 45 at a very maximum. The air conditioning was ok and if it hadn't been for one major point I would have loved them. Quite simply they have no suspension. None at all. Aberdeen is not blessed with silky smooth roads and whenever we hit a pot hole it wasn't just the bus that rattled - and to be fair it didn't rattle much - but I rattled too. On several occasions my spine was jarred and I've never experienced that on a bus before. I can't help wondering if that has something to do with the tri-axle element of the vehicle. But whatever the reason it lets this otherwise decent bus down badly, and that's a shame as there ae many things to like about them. There was much more to see in Aberdeen, including one of the most bizarre rare workings I've ever seen, and a fleet of buses I heard very interesting whispers about, but I will do a separate post for that. Suffice it to say Aberdeen was the most interesting and varied place for buses I've been to for decades and I'm definitely making a return visit soon. And so I need to declare the winner - what is the best new bus around at the moment. Obvously for town work it's the Borismaster, but since it's not possible to travel on one out of town yet they can't really be included in an overall survey. So these are the contenders. I knew which had come bottom but as I travelled from Norwich to Beccles 24 hours into my return journey on Tuesday I was still pondering which vehicle should win. Nothing is perfect and ticks all of my boxes. Then reality kicked in and I realised I was traveling on a bus that was quiet, smooth, comfortable, didn't rattle, not stuffy despite a full load, still pulled away well despite a full load, in fact all round the best bus I had travelled on all trip. 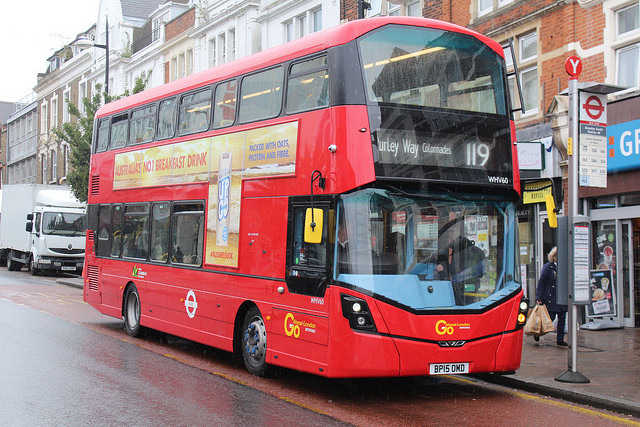 So the winner of best new bus on the market is a 7 year old Volvo B9tl Gemini 1. However it would be unfair if I didn't pick a winner from my list and it must be said that Alexander Dennis have put their act together whereas Wright have gone decidedly wrong. Those who are mournng the fact Norwich lost out on the Streetdecks can breath a sigh of relief. Chris - your aim should be to get as many Geminis as possible for Eastern Counties as they last the pace better than anything else! New vehicles go for MMC's as they are the best new buses around. So if I was waiting at a bus stop not knowing what was about to turn up, this would be my order of preference from the vehicles I sampled last weekend. Look out for special posts on Aberdeen and Borders Railway but I hope you've enjoyed this completely unscientific survey. I always say I'm a passenger first and foremost and these reviews are based soley on the pleasure I derived from traveling on them. Of course cost, fuel economy, emissions etc all play a part in what operators purchase but my backside doesn't take that into account. Welcome to Part Three of my quest to find the best new bus around. In Part One I sampled the new Wright Steetliight and ADL E400MMC. 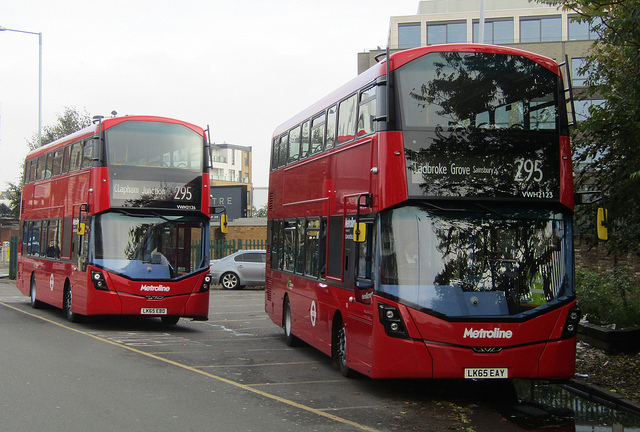 In Part Two the very new ADL E200 was put through its paces and today it's the turn of two more Wright examples, the Streetdeck and Volvo B5tl Gemini3. It was a battle to beat the elements over the weekend, with Saturday morning looking the best chance to stay dry. I wanted to ride Lothian Buses' new Streetdecks on the 100 Airport Express route, but I also wanted to squeeze in a trip on the new Borders Railway to Tweedbank of which a separate post coming soon. So a short tram ride to the airport - Edinburgh fares are extremely cheap unless you want to go to the airport, where they rise dramatically. However I got there and soon spotted the blue double deckers I was looking for. First impressions were good. Comfortable seats and an eye-catching interior with three tables upstairs. But then we started moving. In May when I rode Brighton & Hove's Steetdecks I was undecided about them. Now I'm pretty much decided. They are quite superb buses if the road you are travelling on is as smooth as glass. However if anything bigger than a small ant is on the road you know about it, both in the jolt through your spine and the accompaning rattles. Since we live in the UK where potholes in the road are relatively common it was not the best of rides. I arrived in Edinburgh a little bemused. After my journey to Tweedbank and back the weather closed in and that was that for the day. I adjourned to a bar on the Royal Mile with my friend and forgot about transport for a bit. However it hadn't escaped my notice that Lothian have some more Streetdecks in normal service, and made a mental note to get on one of them the following day to give them every chance possible. So early Sunday morning I was back in Edinburgh City Centre and gave the Streetdeck one last chance. Unfortunately despite giving the Streetdeck another chance it failed to take that chance and all my misgivings from the previous day were confirmed. Lord only knows what these buses will be like in 3 or 4 years time but I certainly won't be that willing to find out. So I turned my attention to another Wright product I thought might prove to be more satisfying - the Gemini 3 bodied Volvo B5tl. 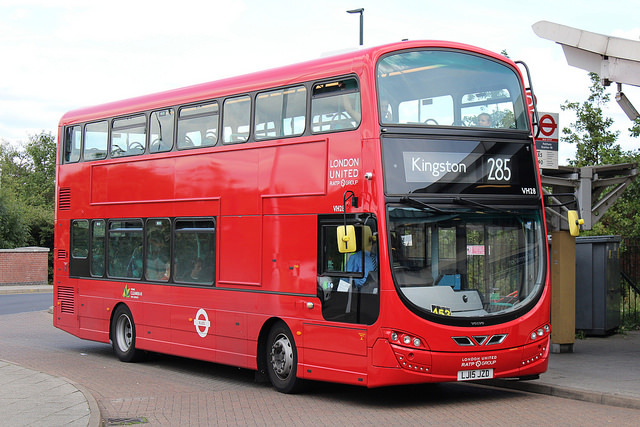 I had already travelled on the hybrid version in London and been impressed with it. And immediately it was noticeably better than the Streetdeck. However despite being quiet with not bad suspension there was still too much noise from the interior and body - in fact more than the Gemini 2 I had been on the previous evening. Good but not quite Carling as they say. In the last post I reviewed the new Wright Streetlite and ADL E400MMC in Stirling, and got a soaking inside an old Scania (not a B10BLE!) en route to Glasgow. If you haven't read Part One see here. I arrived in Glasgow in appalling weather. Storm Abigail was at her strongest and it really wasn't pleasant. There was one more surprise in store - Buchanan Bus Station in Glasgow is huge. I mean really huge. To put it into perspective Victoria coach station has 20 stands. Norwich Bus Station 12, Ipswich about the same. Glasgow Bus Station has 57. Fifty seven stands, or stances as they call them up there. There is a team of marshalls with very loud whistles seeing buses out as they reverse from the stances, and effectively a circular dual carriageway with buses able to reverse out whilst others are going past on the inside. Unfortunately the weather was too awful to get any pics and I wasn't going to upset the marshalls but I will be back. Definitely. However my destination was in fact Hamilton where First Scotland's new ADL E200MMC's were in service on a local route. This involved catching the X1 from Glasgow to Hamilton which felt a bit bizarre but this X1 was truly an X and the B7tl Gemini zoomed down the motorway in the driving rain. I only realised I had arrived in Hamilton when I got my first glimpse of an E200MMC. A few minutes later I was at the right stop and 44655 pulled up. Now regular readers will know what I think of E200's. They are not my favourite bus, and it's only the BorderBus examples I don't mind travelling on. So I boarded this new model with a fair amount of scepticism, not expecting much of a change. Oh me of little faith! They are a huge improvement. Like the E400MMC's they feel far more solid than the old model, a notable absence of rattles, a smoother ride, much quieter and a lower engine pitch with none of the whine of the old one. There was a loud vibration from something at the back but that was somehow reassuring as nothing to comment about would have been distinctly worrying. The braking system sounded remarkably like the Streetlite system but didn't have the jerkiness. In short I was very impressed by the E200 MMC and it was worth getting drenched and blown about to get that ride. 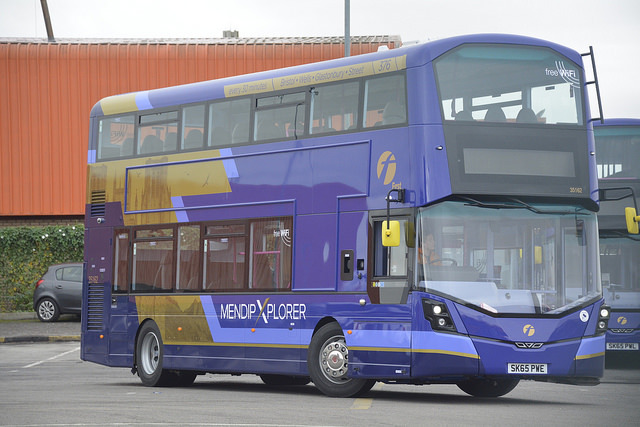 I also happen to think they look rather good too, and for once I'm going to say well done Alexander Dennis, you might just have something there. And so barely an hour after I arrived it was time to return to Glasgow on the X1. This time I managed to get a picture of my chariot - B7tl 37169 SF07 FCY. A very decent journey it was too, and there maybe a hint as to what lies in the future there! The journey back to Edinburgh was not fun. I didn't take note of which God awful bus took me to Falkirk but I think it was a Scania 94 Solar like the 6567* series that Ipswich had from and then sent back to Colchester. The hardest and most uncomfortable seats of all time. After a 45 min wait at Falkirk it was me and 3 drunks on a Streetlite - as mentioned in the previous post the interior lights were so bright you could barely see a thing outside. I was cold, wet, tired, and, after slipping and falling on the tram back to South Gyle, decidedly grumpy when I got back to the hotel. However turning the news on the TV and seeing what was developing in Paris, my woes soon paled into insignificance. In Part Three the Wright Streetdeck and Gemini 3 get put to the test. I have just returned from a long weekend based in Edinburgh, but travelled to many places outside the great city too. I had several missions in mind, and despite the weather trying its hardest to influence things I achieved everything I set out to do. The main mission was to sample as many of today's new buses as possible, to decide once and for all which is the best. The result will be somewhat surprising. Having travelled up by Megabus for next to nothing I set out early the next day for Glasgow. However, as First don't run a direct service from Edinburgh to Glasgow I decided to travel via Stirling, so I could sample First's new E400 MMC's on the Unilink there. I had no idea what would take me there so was pleased when a brand new full length Streetlite turned up. As I haven't been on any of Norwich's new Streetlites yet this has now saved me the trouble, and was a much longer run - nearly two hours. It was good to have such a long run to test the Streetlite out on, in extremely varying weather conditions too, from bright sunshine to torrential rain. However I don't like them. Wright have let their standards slip, of which more later, but the Steetlite is too noisy, too bumpy and too rattly at such a young age. It wasn't even that warm. They feel like vehicles built on the cheap to compete with the E200. Later on in the day I caught another one from Falkirk back to Edinburgh and the interior lights are so bright it is almost impossible to see anything outside. When in unfamiliar territory that is very unhelpful. On arrival at Stirling I was trying to make sense of the confusing maps and route indicators wondering where on earth the Unilink buses went from when rather luckily one pulled in right by me. The driver told me a complete loop took around 40 mins which was perfect to maintain my schedule. These are so much better than the old E400's. They feel like real buses, with a deeper engine tone, more solid suspension that provides a smoother ride, and a much higher feel of quality. Still a few unnecessary rattles but I really enjoyed the circular journey around Stirling and the university. The E400MMC's are not the only unusual deckers First have at Stirling. A fleet of Scania Omnideckers also ply their trade up there. So onto Glasgow, and the journey to Glasgow was provided by what I thought would be the worst ride of the day. For a long journey I was surprised to see Volvo B10BLE 60220 T566 BSS roll in on the X39. Of course, as is the case now the X meant anything but and we went via just about everywhere. The bus also leaked. Badly. In fact at one point I'm not sure if it was raining harder inside or outside the bus. It was a long journey! I do have to ask if the DDA rules applying to single deck buses at the end of the year also apply in Scotland. If so, with only 6 weeks to go First Scotland have a huge number of these B10 BLE's still in service that I assume will have to be replaced. Not sure how they will do it. In the next installment Glasgow and a new E200. While I'm away in Scotland the next few days, heading right into the teeth of Storm Abigail which should be fun, I thought I'd give you something to amuse yourselves by. The world's nicest bloke, Tim Miller, (well who else would turn out to pick me up at 3.30am to take me to Norwich) has sent me a video of his latest trip on the now legendary Short Set and man is the soundtrack good. I suggest listening over headphones for maximum enjoyment and shivers down the spine! Many thanks, Tim - I owe you more than one and I simply must get a ride with those beasts soon. It hasn't gone unnoticed by yours truly that while the DMU's are spectacularly failing to cope with Autumn resulting in whole routes losing services for days the Short Set has coped rather well and excelled itself. There's progress for you! I do hope the Rail Regulator was watching yesterday. The number of cancellations on Abellio Greater Anglia's rural network was nothing short of disgraceful. There were multiple cancellations on the lines serving Ipswich - Felixstowe/Lowestoft, and Norwich - Cambridge/Great Yarmouth/Lowestoft due to what AGA cited as "more trains than usual needing repairs at the same time". Ironically the Short Set was out all day working overtime so those 50yo locos were coping fine. Can someone tell me why in 2015 there aren't enough trains to cope with Autumn, which last time I checked happens every year, and every year the rail network can't cope. There are locos mothballed the rest of the year that operate the RHTT (Rail Head Treatment Trains) every Autumn so why can't some units be stored the same way? Even heritage units could be used. As usual though the paying customer suffers and the only people who don't acknowledge there's a problem have government chauffeurs. It is not good enough and only fuels the flames of the argument for re-nationalsation. Now some good news. Earlier on in the year I, together with East Norfolk Bus Blog put out an appeal for anyone with deep pockets to save the last Volvo Olympian ever built, First Yarmouth's 34110, from the scrap man. I had one interested party who after some consideration decided the costs were prohibitive, but Roy had more luck, and on Tuesday 34110 left Yarmouth for her new home at the Yeldham Transport Collection in Essex, where she will eventually (these things take time) be restored to her former glory. The full story can be read on East Norfolk Bus Blog, but Jamie Skinner, who at one point looked favourite to take on the task of saving 34110, has retained his interest and sent me some pictures of her leaving Yarmouth behind a stunning tow truck. Many thanks Jamie, and well done to you and Roy for achieving this. Appreciation to should go to Chris Speed and Danny Beales for organsing things from First's side, and for recognising the historical importance of the bus. A happy ending. I am off on my travels this week. On Thursday I'm setting off for Edinburgh where there is a huge amount I'm planning to do including travelling on the new Borders Railway, riding some new First E200 and E400 MMC's in Stirling and Glasgow, new Lothian Streetdecks to Edinburgh Airport, and finally popping up to Aberdeen (as you do) to ride the giant tri-axle hydrogen buses up there. Should be a good trip and provide material for a few posts. Incidentally my coach travel from Norwich - London - Edinburgh and back came to a grand total of £4.50 which is cheaper than a return from Wickham Market to Woodbridge. Not bad I guess! Finally I have been somewhat glued to a new railcam I have discovered - in Holland. It is sited in the small town of Mierlo-Hout which is a few miles West of Eindhoven. Thee are three cameras sited by a busy level crossing and there is qute a variety of trains including double decker trains and plenty of freight heading to and from Antwerp and Rotterdam. It is also interesting to watch level crossing protocol with so many bikes around - very disciplined. You will need Silverlight to view the cam, and although I can view it using Firefox or IE I can't using Chrome so if one browser doesn't work try another. The site can be accessed by clicking here. I was told some weeks ago that the X1 and X2 were to undergo some major changes in December, and finally can talk about them as First have today put the forthcoming timetables on their website. Essentually both are to go to 15 min frequencies but with some new areas served, competitive fares and in the case of the X2 some much faster journeys. The X1 returns to its former 15 min frequency between Norwich and Yarmouth. However the "shorts" will continue to James Paget Hospital via Middleton Rd, which until a week ago was served by Anglian's 61. Only two X1's an hour will operate between JPH and Lowestoft, again as before, but these will be evenly interspaced with the 1/1A to essentially maintain a 15 min service between Lowestoft and Yarmouth with both routes taking roughly the same journey time. 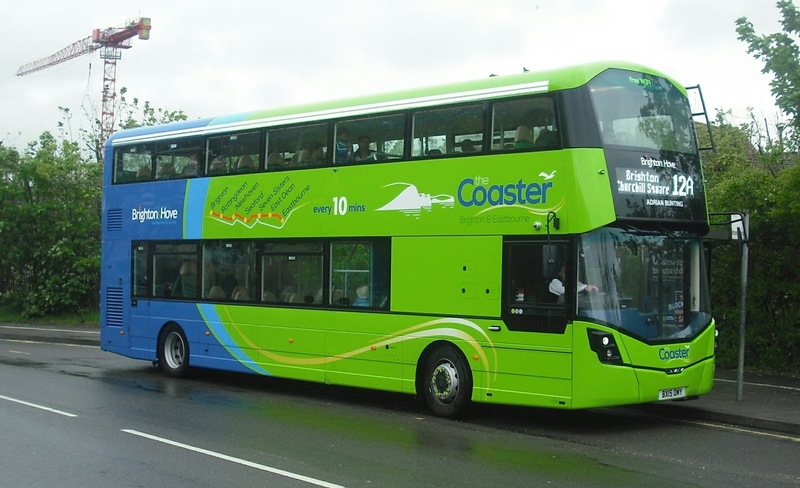 On Sundays there will be a 30 min service with alternate journeys operating as 1A between Lowestoft and Yarmouth. The biggest changes are seen on the X2, with the X22 returning to operate between Lowestoft and Norwich via Carlton Colville. Most X2's will now be fast services, omitting North Cove, and then running fast from Beccles/Gillingham to Norwich omitting Hales and Loddon. X2's will run half hourly, as will the X22, whch from what I can see will mirror BorderBus's 146 between Ribblesdale and East Anglia Transport Museum, before operating the route the X2 does now, with both X22's serving Loddon, and alternate journeys serving North Cove and Hales. Sundays will see an hourly X2 serving the whole route between 0840 and 1905. Fares are reasonable without being dirt cheap. £5.50 for a Lowestoft -Norwich return is much cheaper than the train and competitive with BorderBus, who in recent weeks have been making steady progress on the route. I have to try and stay neutral here. 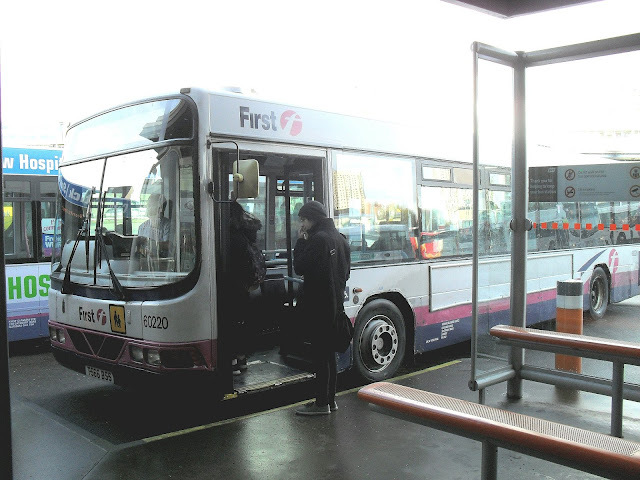 Having said that I must congratulate First's Commercial team for putting together the new X1 timetable so quickly in order to maintain a service for Middleton Rd after it was so summarily abandoned by Anglian. I have observed crazy queues at Norwich for the X1, and the restored 15 min frequency is wholly justified. Just a shame it won't be Ollies and coaches on the "shorts" like it used to be! My personal prediction is this new X1 timetable could be the final nail in the coffin for Anglian's 7. I think their best bet is to restore the old A47's and give the villages a regular link to Yarmouth as well as Norwich again. A 30 min service on the 7 just won't compete with the X1. I have mixed feelings about the X2 changes. BorderBus have proved that a fast service from Beccles to Norwich is desirable and I'm going to stand firm and consistent in my condemnation of operators just trying to poach passengers from competitors by copying - have I mentioned I don't like copying before? When BorderBus started a fast service from Beccles to Norwich it was unique, and now First want to muscle in on it. They are even sending two buses an hour on the 146 route around Carlton Colville. The only redeeming feature is that those buses are the stoppers, so shouldn't have any impact on the 146 custom, and in all honesty I can't see them lasting too long. I'm a little disappointed in First as, like the X1, demand in Norwich justifies the 15 min frequency, and to try and poach a few passengers in Carlton Colville off BorderBus seems a little unnecessary. On the plus side anything that reduces journey times from Lowestoft to Norwich is welcome, and let's face it the Loddon section is very tedious! What would be even more welcome is to see effort put into feeder services from other areas so more people who don't actually live on the routes can connect with and use them. The changes come into operation on Dec 7th, and full details and timetables can be accessed on First's website by clicking here. In the media world the initials AP normally stand for Associated Press, who together with Reuters and East Norfolk Bus Blog are the main news agencies broadcasters and newspapers rely on for material and breaking news. Yesterday, however, AP stood for Andrew Pursey, who within minutes of me posting about the mysterious trolleybus spotted in Beccles, had emailed me with information. Andrew told me the trolleybus had just returned from a trolleybus festival in Saltzburg, Austria, and provided an article showing 135 in attendance. Unfortunately the accompaning text is only available in german, so I have had to use Google Translate, and then translate the translation into understandable english. The following pic is taken from trolleymotion.eu and you can access the full article by clicking here. The translation eventually proved quite informative, and revealed that rather than being a Saltzburg veteran as I assumed, 135 was in fact, as Andrew Kleissner correctly commented, a trolleybus that plied its trade in Kaiserslauten in Germany. However there is more to this Mercedes O 305 GT trolleybus than meets the eye. Hang on - GT?? Grand Tourismo? Ooookay fair enough. Anyway 135 started life as a normal diesel bus in 1970, clocking up many thousands of miles before being converted to a trolleybus in 1978. Andrew says it went to EATM in 1985 but there is no trace of it now. The article states it has been in private ownership in England since 1994, and is kept in storage somewhere in the Beccles area. That might explain the lack of info in the EATM website, and no one from EATM has as yet been in touch about it. So I did a bit more digging, hoping to find some pictorial record of 135 in action in Kaiserslauten. Alas that didn't unearth anything, and I still don't know why it has a GB plate although J reg is 1970 I believe so it's the right year. But I did find this video taken in Saltzburg at the 75th anniversary a month ago showing 135 in action. I take no responsibiity for the annoying music in the video, but the picture is of amazing quality. My thanks to the two Andrews for taking the time and effort to get in touch with information, and to my friend at Anglian for spotting 135 in the first place. Certainly made a pleasant change researching it.